3. Many subjects covered: Because the lessons are short, we cover many more subjects per day and week than the children would cover in school or with another style of homeschooling. 4. Fine arts: We enjoy studying composers, artists and their works. The children are developing an appreciation for the fine arts. 5. Respect for the child: By offering short lessons, which are geared to the natural attention span of the child, we show respect for their attentive abilities. By not giving them "twaddle" to read, we show respect for their intelligence. 6. Respect for nature: Nature studies develop within the child a respect for nature and God's creative generosity. 7. Respects the whole child: This method not only addresses academics, but also considers the entire being - mind, body and spirit. It addresses nutrition, habits, cleanliness, manners, play time, exercise and more. 8. Very few textbooks and many living books: The children do not have their mental capabilities insulted with dry, boring texts. The books to which they are exposed are 'alive' and engaging, pulling the child into the time and place in which the stories are set. It is easier to retain what one has 'lived' than to retain boring facts. 9. Combining Subjects: Subjects are often combined or used as a catapult to other subjects. For instance, the bible, history and geography are linked together. Choosing artists and composers from the same time period blends well. It makes logical sense and gives the child a sense of what life was like in the given time period. As well, it makes for a much shorter homeschool day. 10. Teaching multiple ages: Using this method, I am able to teach multiple ages at the same time. Except for subjects like math, most everything can be taught to all children at the same time. I was just thinking about you this afternoon and I thought I would pop over to see what you have been up to. Thanks for stopping by Ladies! Barb... we're doing ok. Thanks for sharing my post. Great list! 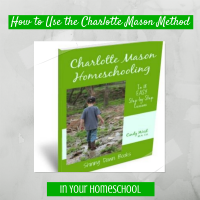 Thank you for submitting it to the next Charlotte Mason Blog Carnival. Thank you for sharing your list - it's fun to see what others think is great about the method. I found your blog from the Charlotte Mason Carnival. You have a wonderful blog with so much information. I plan to visit here often. Yes! What a great list. I can't say we've had "no tears" in our CM homeschool, but the rest of your list is spot on.